Shane Climenhaga - The Chip's Challenge Wiki - The Chip's Challenge Database that anyone can edit! Ben Hornlitz (also known as just Hornlitz; real name Shane Climenhaga) is a chipster in the CC community known for being one of the first people to optimize levels in the Lynx ruleset. He is also one of the many Let's Players in the CC community. He has previously LPed TS0 and Let's Failed the Custom Level "Delivery Ship" by ChipHome5 in his set, ChipHomeIS.dat. He is currently LPing ArchieP1. He has released 2 sets, BHLS1 and BHLS2, and is currently working on BHLS3. Ben was on the CCLP1 staff as a tester for the MS ruleset. He also is one of the people who runs the ChipWiki channel, and he also fully runs the ChipsChallengeCustoms channel. BHLS1 is Ben's first set, which consists of 149 Levels. Most of the levels are short concept levels, or simple levels he made before he discovered the community. 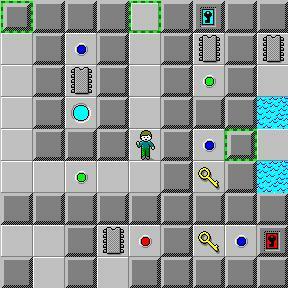 Not all 149 levels were created by Ben either; some levels were created by his siblings and cousins. A lot of the levels contained invalid tiles however, so the creator edited the set to create BHLS1Lynx, which had 138 levels, and no invalid tiles. The set, however, did not fix all the inequalities, and thus many levels were still impossible in lynx. This set was LPed by the chipster known as Josh Lee, or Flareon350. BHLS2 is Ben's second set, which consists of 70 levels, all solvable in both rulesets, with a dummy level at the end. The creator had a lot of difficulty creating this set, because he didn't have many ideas for levels. The first few levels are short concept levels, but the set really picks up in difficulty soon after. About halfway through the set, the difficulty decreases again, because the creator realized how difficult a lot of his levels were. This set was being LPed by Andrew Bennett (Also known as ManipulatorGeneral or Octavarium64), but the LP was cancelled. On April 12, 2013, Ben announced his new set in the works, BHLS3. Because Ben didn't enter the community until after CCLP3 was released, he did not worry much about the scoring in CC1 and CCLP2. His CC1 score is 5,964,240, which puts him in 54th place, and his CCLP2 score is 6,021,850, which lands him at 26th. He had much more interest in CCLP3, however, which led him to optimize it more. He has scored 6,080,720 in MS for CCLP3, which gets him 5th place. After that, he decided he would try optimizing Lynx, but despite the difficulty that came with it, he enjoyed it. He has scored 6,035,820 in CCLP3 Lynx, which puts him in 2nd place. Ben is known for getting lots of new records in Lynx, especially on levels that have insane amounts of timing.